Originally named Romulus in honor of the mythological founder of Rome who was said to have been raised by a she-wolf, Wolfie, as students have come to call him overtime, is The American University of Rome’s mascot. 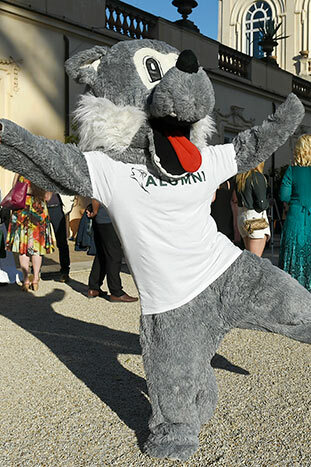 AUR’s mascot, Wolfie, was the first of its kind in Rome and has been proudly representing the University since his debut in 2006. Since his first appearance, Wolfie has become a lively symbol for AUR athletic teams, known as Wolves and She-Wolves, as well as the University as a whole. As a representation of AUR Wolfie’s uniqueness as the first university mascot in the Campionato di Calcio delle Università Romane (the Italian collegiate soccer league), Wolfie carries a small but special place in the history of Rome’s intercollegiate athletics. Today Wolfie can be found roaming around during athletic events, orientation, and various campus activities, greeting students and visitors while spreading a little AUR pride.